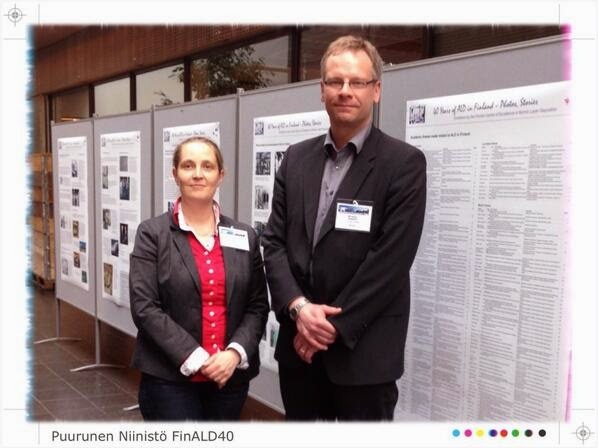 "40 Years of ALD in Finland: Photos, Stories” organizers in front of the finalized posters, Dr. Riikka Puurunen and Dr. Jaakko Niinistö (Picture from Twitter, Riikka Puurunen @rlpuu). A new technique for fabricating high-quality epitaxial oxide thin films on amorphous substrates such as glass has been developed by Japaneese reserachers from University of Tokyo, Kanagawa Academy of Science and Technology, Japan Science and Technology Agency and National Institute for Materials Science. The new manufacturing method called lateral solid-phase epitaxy, could help realise applications of oxide-based thin film devices. This is especially interesting for large scale production of flexible electronics on foil or large glass substrates used in e.g. display technology. The results has been published in ACS Nano (abstract and supporting information below). Pictures from graphical abstratct (ACS Nano). Abstract: We developed a technique to fabricate oxide thin films with uniaxially controlled crystallographic orientation and lateral size of more than micrometers on amorphous substrates. 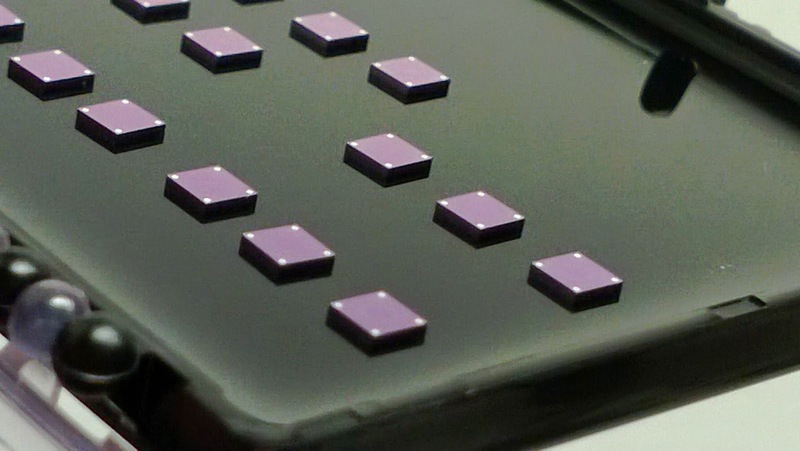 This technique is lateral solid-phase epitaxy, where epitaxial crystallization of amorphous precursor is seeded with ultrathin oxide nanosheets sparsely (≈10% coverage) deposited on the substrate. Transparent conducting Nb-doped anatase TiO2 thin films were fabricated on glass substrates by this technique. Perfect (001) orientation and large grains with lateral sizes up to 10 μm were confirmed by X-ray diffraction, atomic force microscopy, and electron beam backscattering diffraction measurements. As a consequence of these features, the obtained film exhibited excellent electrical transport properties comparable to those of epitaxial thin films on single-crystalline substrates. This technique is a versatile method for fabricating high-quality oxide thin films other than anatase TiO2 and would increase the possible applications of oxide-based thin film devices. [ACS Nano free Supporting information] An alkaline-free glass substrate sparsely covered with Ca2Nb3O10 nanosheets was prepared by the same process described in the main text. Amorphous SrTiO3 (STO) precursor films were fabricated on the unheated substrate by pulsed laser deposition (PLD) with a single crystalline STO plate target. Partial oxygen gas pressure (PO2) was set at 10−3 Torr during the deposition. A 1-nm-thick STO secondary seed layer was also fabricated by PLD at TS = 400 °C prior to the deposition of the precursor film. The precursor film was crystallized by post-deposition annealing at 600 °C for 1 hour under H2 atmosphere (1 atm) in an infrared image furnace. After the annealing, the crystallographic structure and orientation of the film were determined by X-ray diffraction (XRD) measurements with a two-dimensional area detector. Figure S1a shows the θ-2θ XRD profile of the STO thin film fabricated on a glass substrate by NS-LSPE with the 1 nm-secondary seed layer. 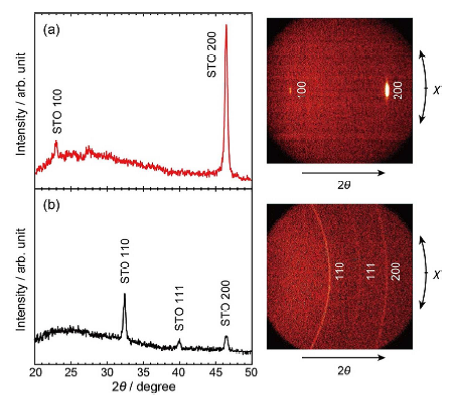 Only 100 and 200 diffraction peaks with spot-like shapes were recognizable, which indicates perfectly (100)-oriented growth of STO, as expected from good lattice-matching with Ca2Nb3O10 nanosheets (−1.0%). In contrast, in case of STO film fabricated directly on bare glass by solid phase crystallization, only Debye rings of 110 and 200 diffractions from randomly oriented grains were observed (Fig. S1b). These results verify the versatility of the NS-LSPE technique for oxide thin films other than TiO2. Abstract: Although semiconductors such as silicon (Si), gallium arsenide (GaAs), and gallium phosphide (GaP) have band gaps that make them efficient photoanodes for solar fuel production, these materials are unstable in aqueous media. We show that TiO2 coatings (4 to 143 nanometers thick) grown by atomic layer deposition prevent corrosion, have electronic defects that promote hole conduction, and are sufficiently transparent to reach the light-limited performance of protected semiconductors. In conjunction with a thin layer or islands of Ni oxide electrocatalysts, Si photoanodes exhibited continuous oxidation of 1.0 molar aqueous KOH to O2 for more than 100 hours at photocurrent densities of >30 milliamperes per square centimeter and ~100% Faradaic efficiency. TiO2-coated GaAs and GaP photoelectrodes exhibited photovoltages of 0.81 and 0.59 V and light-limiting photocurrent densities of 14.3 and 3.4 milliamperes per square centimeter, respectively, for water oxidation. As reported by Applied Materials: SANTA CLARA, Calif., May 28, 2014 - Applied Materials, Inc. today introduced the Endura® VenturaTM PVD system that helps customers reduce the cost of fabricating smaller, lower power, high-performance integrated 3D chips. The system incorporates Applied's latest innovations to its industry-leading PVD technology that enables the deposition of thin, continuous barrier and seed layers in through-silicon-vias (TSVs). Demonstrating Applied's precision materials engineering expertise, the Ventura system also uniquely supports the use of titanium in volume production as an alternate barrier material for lower cost. With the launch of the Ventura system, Applied is expanding its comprehensive toolset for wafer level packaging (WLP) applications, including TSVs, redistribution layer (RDL) and Bump. TSVs are a critical technology for vertically fabricating smaller and lower power future mobile and high-bandwidth devices. Vias are short vertical interconnects that pass through the silicon wafer, connecting the active side of the device to the back side of the die, providing the shortest interconnect path between multiple chips. Integrating 3D stacked devices requires greater than 10:1 aspect ratio TSV interconnect structures to be metallized with copper. The new Ventura tool solves this challenge with innovations in materials and deposition technology to manufacture TSVs more cost-effectively than previous industry solutions. "Building on 15 years of leadership in copper interconnect technology, the Ventura system enables fabrication of robust high-aspect ratio TSVs, with up to 50 percent barrier seed cost savings compared to copper interconnect PVD systems," said Dr. Sundar Ramamurthy, vice president and general manager of Metal Deposition Products at Applied Materials. "These innovations deliver a higher-performance and more functional, yet, compact chip package with less power consumption to meet leading-edge computing needs. Customers are realizing the benefits of this new PVD system and are qualifying it for volume manufacturing." Supporting the manufacture of high-yielding 3D chips, the Ventura system introduces advances in ionized PVD technology that assure the integrity of the barrier and seed layers that are critical to superior gap-fill and interconnect reliability. These developments significantly improve ion directionality to enable the deposition of thin, continuous and uniform metal layers deep into the vias to achieve the void-free fill necessary for robust TSVs. With the improvement in directionality, higher deposition rates can be achieved, while the amount of barrier and seed material needed can be reduced. These attributes of the Ventura system and the adoption of titanium as an alternate barrier are expected to improve device reliability and reduce the overall cost of ownership for TSV metallization. Picosun reports that they now offers new industrial ALD processes for copper and niobium oxide using the 2nd generation of the Picohot™ 300 source system. 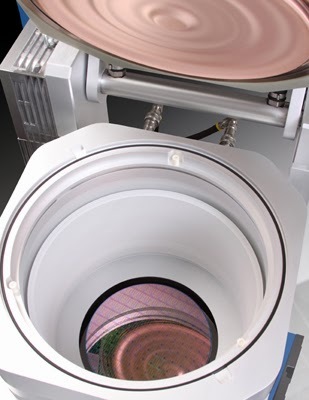 Ultra-thin copper films with the highest level of uniformity and conformality only ALD can offer as a thin film deposition method are a crucial element in today’s and future’s microelectronics and MEMS (microelectromechanical sensors) manufacturing. Copper metallization and seed layers are needed in e.g. microprocessors and 3D-integrated microelectronic components as interconnects. Niobium oxide (Nb2O5), on the other hand, is ideal for moisture and corrosion protection due to its hardness and chemical resistance. The now developed low temperature (below 150 °C) thermal ALD processes for niobium oxide and copper have been enabled by Picosun’s newest generation of precursor source design. The 2nd generation of the Picohot™ 300 source system allows even lower vaporization temperatures and efficient, uniform distribution of the precursor vapor in the reaction chamber even at low substrate temperatures. “Our new processes for copper and niobium oxide show again the excellent quality of Picosun’s precursor source design, allowing true ALD processing also on thermally sensitive materials such as plastics and piezoelectrical elements. On several of Picosun’s main market areas such as MEMS, microelectronics, and corrosion protection, these processes further solidify our status as the leading solution provider of the thin film coating needs of today’s industries,” states Juhana Kostamo, Managing Director of Picosun. Picosun’s highest level ALD thin film technology enables the industrial leap into the future by novel, cutting-edge coating solutions, with four decades of continuous, groundbreaking expertise in the field. Today, PICOSUN™ ALD systems are in daily production use in numerous prominent industries around the globe. Picosun is based in Finland, with subsidiaries in USA, China, and Singapore, and a world-wide sales and support network. RWTH Aachen fabricate ferroelectric hafnium oxide with a remnant polarization of >13 μC/cm2 by chemical solution deposition - to be specific - a yttrium-doped hafnium oxide films on platinum electrodes. This work opens up opportunities for applications using a thicker ferroelectric material than for ALD films at about 10nm that has been developed recent years by NaMLab and Fraunhofer IPMS-CNT. Abstract: Ferroelectric hafnium oxide films were fabricated by chemical solution deposition with a remnant polarization of >13 μC/cm2. 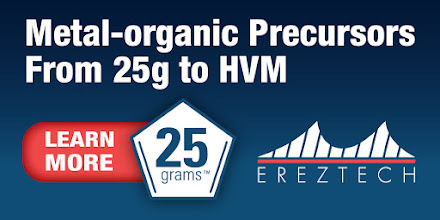 The samples were prepared with 5.2 mol. % yttrium-doping and the thickness varied from 18 nm to 70 nm. The hafnium oxide layer was integrated into a metal-insulator-metal capacitor using platinum electrodes. Due to the processing procedure, no thickness dependence of the ferroelectric properties was observed. To confirm the ferroelectric nature of the deposited samples, polarization, capacitance, and piezoelectric displacement measurements were performed. However, no evidence of the orthorhombic phase was found which has been proposed to be the non-centrosymmetric, ferroelectric phase in HfO2. 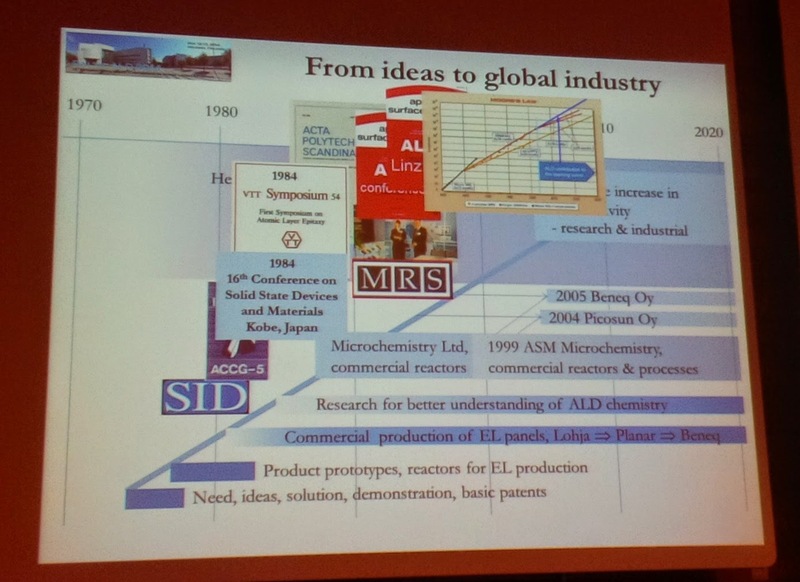 Dr. Tuomo Suntola, has shared his opening presentation "From ideas to global industry" from the recently held Baltic ALD conference, May 12-13, 2014, University of Helsinki [thanks Riikka for sharing]. 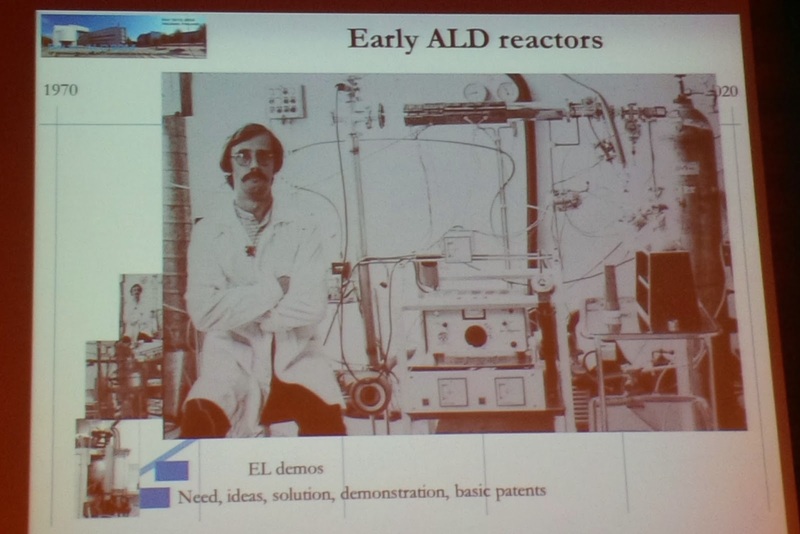 T. Suntola, "From ideas to global industry"
In late 1973 instrumentarium Oy was searching for new challenges. 1.1.1974 a research unit headed by Tuomo Suntola was formed and The Proposal was given to the board by Dr. Tuomo Sunola: "Let´s develop an electroluminicent flat panel display...nobody has done it yet"
The famous picture of Sven Lindfors, today Chief Technology Officer and a Member of the Board of Directors of Picosun.“We had numerous unsuccessful test runs behind us. Dr. Tuomo Suntola knew that in order to proceed, we needed to advance from using pure chemical elements to an exchange reaction based on carrier gases and sulphides,” says Sven Lindfors, at the time working as a key technician for Dr Suntola’s team. (Source Picosun Newsletter : http://www.picosun.com/binary/file/-/id/3/fid/79/). Introduction of high-k materials by ALD in the semiconductor industry for DRAM Capacitors and MOSFETs and the contribution of ALD to the learning curve to keep up with Moore's Law. T. Suntola, "30 years of ALD"
T. Suntola, "ALD for advanced semiconductor and nanotechnology manufacturing"
T. Suntola, "35 years of ALD"
T. Suntola, "Invention of ALD and protection of knowledge"
A very interesting fresher than fresh PhD Thesis from Royal Institute of Technology (KTH), Sweden on the Integration of thulium silicate for enhanced scalability of high-k/metal gate CMOS technology. The ALD processing in this work has been preformed in a Beneq TFS 200 ALD system - a crossflow-type 200mm hot-wall reactor. 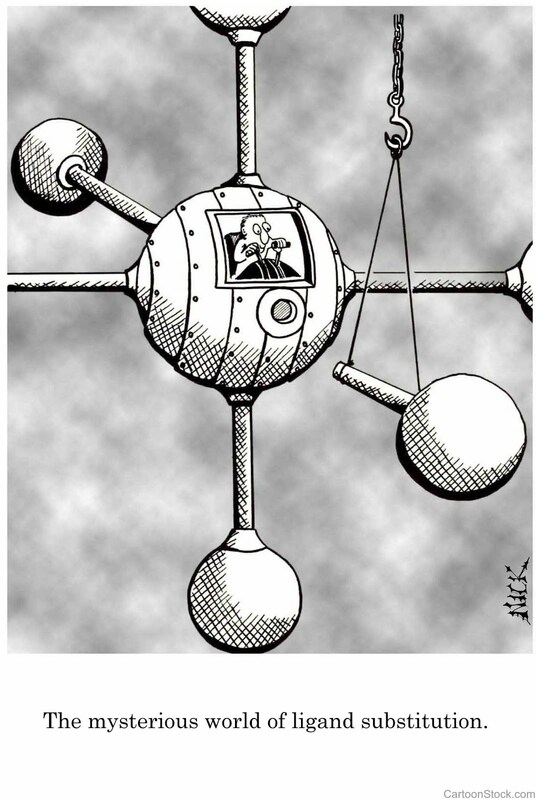 The public defense will take place on 27 May 2014 at 10.00 a.m. in Sal D, Forum, Kungliga Tekniska Högskolan, Isafjordsgatan 39, Kista. - Best of luck! 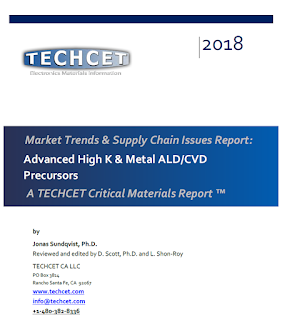 Abstract: High-k/metal gate stacks have been introduced in CMOS technology during the last decade in order to sustain continued device scaling and ever improving circuit performance. Starting from the 45nm technology node, the stringent requirements in terms of equivalent oxide thickness and gate current density have rendered the replacement of the conventional SiON/poly-Si stack unavoidable. Although Hf-based technology has become the de facto industry standard for high-k/metal gate MOSFETs, problematic long-term scalability has motivated the research of novel materials and solutions to fulfill the target performances expected of gate stacks in future technology nodes. In this work, integration of a high-k interfacial layer has been identified as the most promising approach to improve gate dielectric scalability, since this technology presents the advantage of potential compatibility with both current Hf-based and plausible future higher-k materials. Thulium silicate has been selected as candidate material for integration as interfacial layer, thanks to its unique properties which enabled the development of a straightforward integration process achieving well-controlled and repeatable growth in the sub-nm thickness regime, a contribution of (0.25 ± 0.15)nm to the total EOT, and high quality of the interface with Si. Compatibility with industry-standard CMOS integration flows has been kept as a top priority in the development of the new technology. To this aim, a novel ALD process has been developed and characterized, and a manufacturable process flow for integration of thulium silicate in a generic gate stack has been designed. The thulium silicate interfacial layer technology has been verified to be compatible with standard integration flows, and fabrication of high-k/metal gate MOSFETs with excellent electrical characteristics has been demonstrated. The possibility to achieve high performance devices by integration of thulium silicate in current Hf-based technology has been specifically demonstrated, and the TmSiO/HfO2 dielectric stack has been shown to be compatible with the industrial requirements of operation in the sub-nm EOT range (down to 0.6nm), reliable device operation over a 10 year expected lifetime, and compatibility with common threshold voltage control techniques. 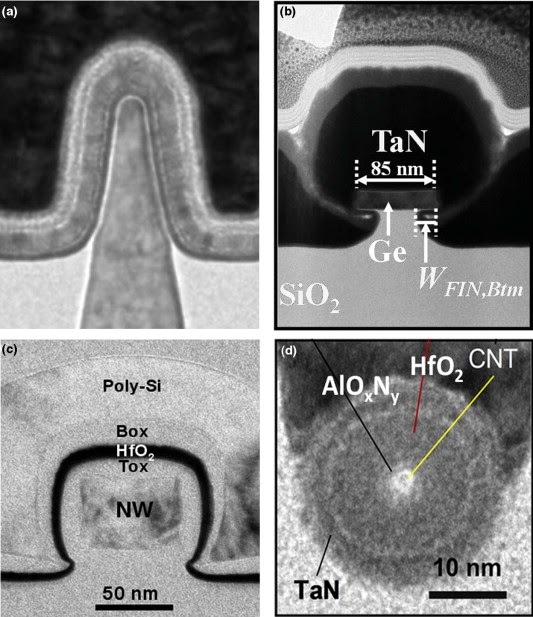 The thulium silicate interfacial layer technology has been especially demonstrated to be superior to conventional chemical oxidation in terms of channel mobility at sub-nm EOT, since the TmSiO/HfO2 dielectric stack achieved 20% higher electron and hole mobility compared to state-of-the-art SiOx/HfO2 devices at the same EOT. Such performance enhancement can provide a strong advantage in the EOT-mobility trade-off which is commonly observed in scaled gate stacks, and has been linked by temperature and stress analyses to the higher physical thickness of the high-k interfacial layer, which results in attenuated remote phonon scattering compared to a SiOx interfacial layer achieving the same EOT. Researchers at University of Colorado at Boulder, Brookhaven National Laboratory, and Seoul National University, has shown that a Al2O3 coating deposited by Atomic Layer Deposition (ALD) dramatically reduces the degradation in cell conductivity and reaction kinetics of commercially available cathode material used in today's state-of-art Li-ion batteries, lithium nickel–manganese–cobalt oxide Li[Ni1/3 Mn1/3Co1/3]O2 a.k.a. NMC. The researches have developed a new durable ultra-thin Al2O3-ALD coating layer that also improves stability for the NMC at an elevated temperature. Furthermore, the experimental results suggest that a highly durable and safe cathode material enabled by atomic-scale surface modification can meet the demanding performance and safety requirements of next-generation electric vehicles. 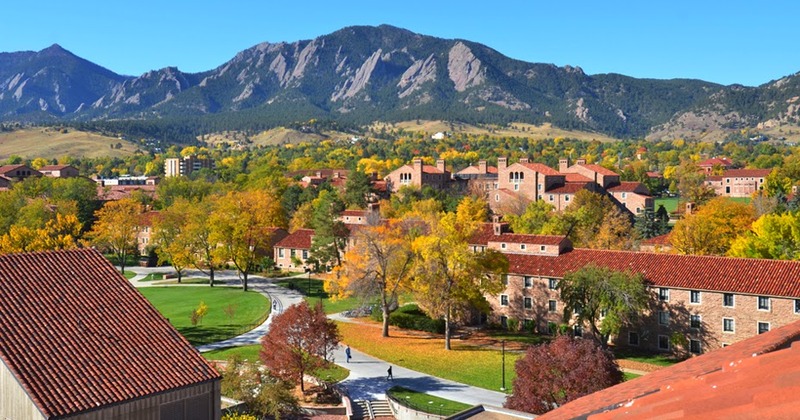 The University of Colorado Boulder (also commonly referred to as CU-Boulder, CU, Boulder, or Colorado) is a public research university located in Boulder, Colorado, United States. It is the flagship university of the University of Colorado system and was founded five months before Colorado was admitted to the union in 1876. According to The Public Ivies: America's Flagship Public Universities (2001), it is considered one of the thirty "Public Ivy League" schools. (Source: Wikipedia, Picture : The Campus of University of Colorado Boulder, http://www.colorado.edu/). The work has been funded by by National Science Foundation (USA), Department of Energy (USA), and Ministry of Knowledge Economy (KOR). Abstract: Electric-powered transportation requires an efficient, low-cost, and safe energy storage system with high energy density and power capability. Despite its high specific capacity, the current commercially available cathode material for today's state-of-art Li-ion batteries, lithium nickel–manganese–cobalt oxide Li[Ni1/3 Mn1/3Co1/3]O2 (NMC), suffers from poor cycle life for high temperature operation and marginal rate capability resulting from irreversible degradation of the cathode material upon cycling. Using an atomic-scale surface engineering, the performance of Li[Ni1/3Mn1/3Co1/3]O2 in terms of rate capability and high temperature cycle-life is significantly improved. 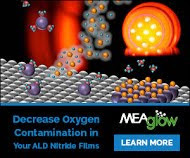 The Al2O3 coating deposited by atomic layer deposition (ALD) dramatically reduces the degradation in cell conductivity and reaction kinetics. This durable ultra-thin Al2O3-ALD coating layer also improves stability for the NMC at an elevated temperature (55 °C). The experimental results suggest that a highly durable and safe cathode material enabled by atomic-scale surface modification could meet the demanding performance and safety requirements of next-generation electric vehicles. ASM International "One cannot think now, the world without Atomic Layer Deposition"
ASM International, one of the leading suppliers of ALD equipment for the semiconductor market has recently updated its web appearance. There are a number of videos that give insights in how ASM and the employees are innovating in the Semiconductor ALD market. 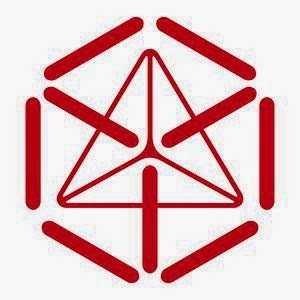 And don´t forget - the best page for all Pulsar fans - The switch is on: http://asmtheswitchison.com/. Tanja talks about the Thermal Products business unit and how being ‘fast, first and the best’ with ASM innovations like Atomic Layer Deposition (ALD) inspires her. “I expect innovation from everyone.” Suvi who is recognized, globally, as a pioneering expert in Atomic Layer Deposition (ALD) gives us an insight into her world. Doug explains about marketing Atomic Layer Deposition (ALD) technology and the benefits of working at such a diverse, global company like ASM. MIT News reports - Now researchers at MIT and the University of Michigan have come up with a way of producing graphene, in a process that lends itself to scaling up, by making graphene directly on materials such as large sheets of glass. The process is described, in a paper published this week in the journal Scientific Reports, by a team of nine researchers led by A. John Hart of MIT. Lead authors of the paper are Dan McNerny, a former Michigan postdoc, and Viswanath Balakrishnan, a former MIT postdoc who is now at the Indian Institute of Technology. Read all details about this new approach to manufacture sheets of graphene in the open access Scientific Reports article below. 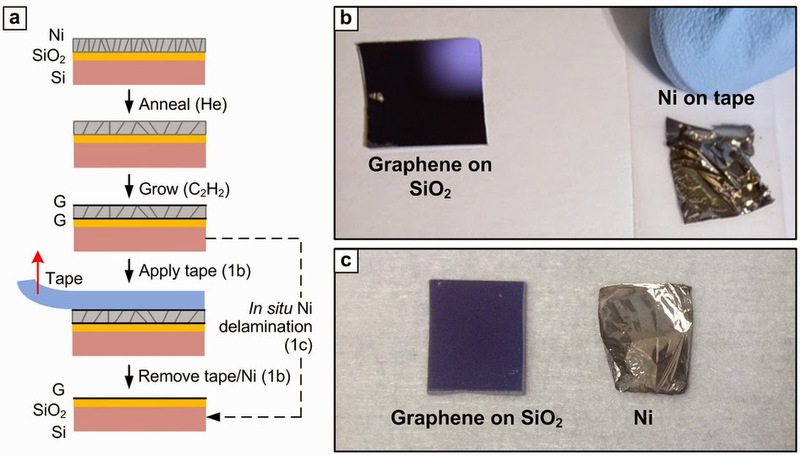 Abstract: We demonstrate direct production of graphene on SiO2 by CVD growth of graphene at the interface between a Ni film and the SiO2 substrate, followed by dry mechanical delamination of the Ni using adhesive tape. This result is enabled by understanding of the competition between stress evolution and microstructure development upon annealing of the Ni prior to the graphene growth step. When the Ni film remains adherent after graphene growth, the balance between residual stress and adhesion governs the ability to mechanically remove the Ni after the CVD process. In this study the graphene on SiO2 comprises micron-scale domains, ranging from monolayer to multilayer. The graphene has >90% coverage across centimeter-scale dimensions, limited by the size of our CVD chamber. Further engineering of the Ni film microstructure and stress state could enable manufacturing of highly uniform interfacial graphene followed by clean mechanical delamination over practically indefinite dimensions. Moreover, our findings suggest that preferential adhesion can enable production of 2-D materials directly on application-relevant substrates. This is attractive compared to transfer methods, which can cause mechanical damage and leave residues behind. Nanotechweb.org reports that Researchers in the US have unveiled a new CMOS-compatible technology to integrate different two-dimensional materials into a single electronic device. 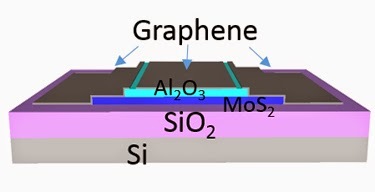 The team, led by Tomás Palacios of the Massachusetts Institute of Technology, constructed large-scale electronic circuits based on graphene and molybdenum sulphide heterostructures grown by chemical vapour deposition where MoS2 was used as a transistor channel, and graphene as contact electrodes and circuit interconnects. The fabrication process itself might be extended to fabricate heterostructures from any type of 2D layered material with potential applications in flexible and transparent electronics, sensors, tunnelling FETs and high-electron mobility transistors. Demonstration of a novel technology for constructing large-scale electronic systems based on graphene/molybdenum disulfide (MoS2) heterostructures grown by chemical vapor deposition. Abstract: Two-dimensional (2D) materials have generated great interest in the past few years as a new toolbox for electronics. This family of materials includes, among others, metallic graphene, semiconducting transition metal dichalcogenides (such as MoS2), and insulating boron nitride. These materials and their heterostructures offer excellent mechanical flexibility, optical transparency, and favorable transport properties for realizing electronic, sensing, and optical systems on arbitrary surfaces. In this paper, we demonstrate a novel technology for constructing large-scale electronic systems based on graphene/molybdenum disulfide (MoS2) heterostructures grown by chemical vapor deposition. We have fabricated high-performance devices and circuits based on this heterostructure, where MoS2 is used as the transistor channel and graphene as contact electrodes and circuit interconnects. We provide a systematic comparison of the graphene/MoS2 heterojunction contact to more traditional MoS2-metal junctions, as well as a theoretical investigation, using density functional theory, of the origin of the Schottky barrier height. The tunability of the graphene work function with electrostatic doping significantly improves the ohmic contact to MoS2. These high-performance large-scale devices and circuits based on this 2D heterostructure pave the way for practical flexible transparent electronics. "The biggest problem with designing load-bearing supercaps is preventing them from delaminating," said Westover. "Combining nanoporous material with the polymer electrolyte bonds the layers together tighter than superglue." Abstract: A load-bearing, multifunctional material with the simultaneous capability to store energy and withstand static and dynamic mechanical stresses is demonstrated. This is produced using ion-conducting polymers infiltrated into nanoporous silicon that is etched directly into bulk conductive silicon. This device platform maintains energy densities near 10 W h/kg with Coulombic efficiency of 98% under exposure to over 300 kPa tensile stresses and 80 g vibratory accelerations, along with excellent performance in other shear, compression, and impact tests. This demonstrates performance feasibility as a structurally integrated energy storage material broadly applicable across renewable energy systems, transportation systems, and mobile electronics, among others. As reported today by Sean Nealon, UC Riverside, Researchers at the Univ. of California, Riverside have developed a novel nanometer scale ruthenium oxide anchored nanocarbon graphene foam architecture that improves the performance of supercapacitors, a development that could mean faster acceleration in electric vehicles and longer battery life in portable electronics. Abstract: In real life applications, supercapacitors (SCs) often can only be used as part of a hybrid system together with other high energy storage devices due to their relatively lower energy density in comparison to other types of energy storage devices such as batteries and fuel cells. Increasing the energy density of SCs will have a huge impact on the development of future energy storage devices by broadening the area of application for SCs. 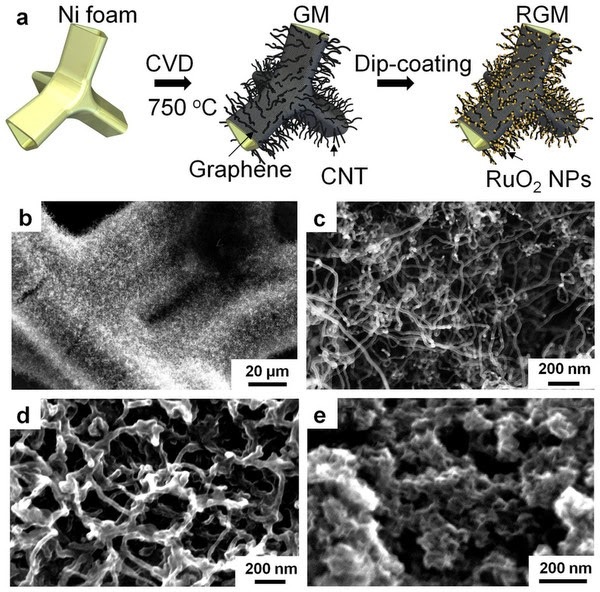 Here, we report a simple and scalable way of preparing a three-dimensional (3D) sub-5 nm hydrous ruthenium oxide (RuO2) anchored graphene and CNT hybrid foam (RGM) architecture for high-performance supercapacitor electrodes. This RGM architecture demonstrates a novel graphene foam conformally covered with hybrid networks of RuO2 nanoparticles and anchored CNTs. SCs based on RGM show superior gravimetric and per-area capacitive performance (specific capacitance: 502.78 F g−1, areal capacitance: 1.11 F cm−2) which leads to an exceptionally high energy density of 39.28 Wh kg−1 and power density of 128.01 kW kg−1. 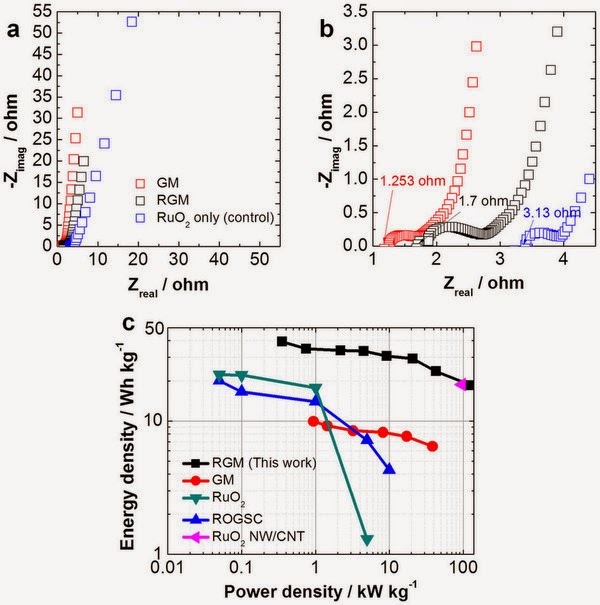 The electrochemical stability, excellent capacitive performance, and the ease of preparation suggest this RGM system is promising for future energy storage applications. Check out the performance in this Ragone plot - Woah - pretty high energy density material! 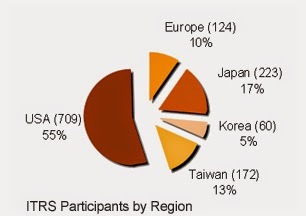 ITRS 2013 Emerging Research Devices (ERD) Chapter has been updated on ferroelectric devices (page 13) referring to recent development using ferroelectric hafnium oxide. From Page 12 : Notably, since 2011, ferroelectricity in a variety of doped and polycrystalline HfO2 has been reported. The HfO2 based FeFETs show promising write speed (down to a few ns), retention (projected to 10 years), and endurance (up to 1012), which all match the best performances of its perovskite counterparts (refer to ERD4a). [65,66,67,68,69], and HfO2-based FeFETs have been fabricated using standard high-k metal gate (HKMG) processes. The use of HfO2-based ferroelectrics significantly reduces the physical thickness of the gate stack, and in turn scales down the channel length to the current technology node . Follow the typical HKMG process, SiO2 serves as the buffer layer between HfO2 and Si with a sub-nanometer thickness, yielding low depolarization field. "In Ferroelectric FET memory, a ferroelectric dielectric forms the gate insulator of an FET. 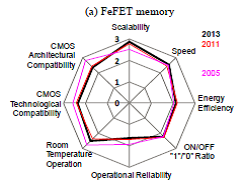 The main concern on FeFET memory lies in operation reliability. Operational reliability of the FeFET RAM is limited by the time dependant remnant polarization of the ferroelectric gate dielectric reflected in retention loss. Control of the ferroelectric-semiconductor interface is critical for FeFET properties. The scalability of FeFET memory beyond the 22nm generation is uncertain"
"RRAM include multiple device types and mechanisms with varying level of maturity. The survey is based on rating of the general field rather than specific types. Some recent breakthrough in RRAM significantly enhanced perceived potential of this technology, e.g., 32Gb array demonstration726. 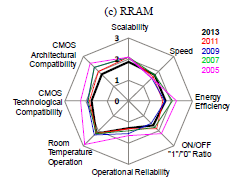 Overall RRAM assessment is similar or better than existing CMOS-based nonvolatile memories (Flash). A clear advantage of RRAM is scalability owing to the filamentary conduction and switching mechanisms. The simple device structure and fab-friendly materials also contribute to high rating in CMOS compatibility. One of the major concerns of RRAM is the operation reliability due to the stochastic nature and the defect-related mechanisms. Large variation of RRAM switching parameters has been commonly observed and is considered an intrinsic feature of RRAM mechanisms." T. S. Boscke, J. Muller, D. Brauhaus, U. Schroder, and U. Bottger, "Ferroelectricity in hafnium oxide: CMOS compatible ferroelectric field effect transistors," IEDM 2011, pp. 24.5.1–24.5.4. M. Hyuk Park, H. Joon Kim, Y. Jin Kim, W. Lee, H. Kyeom Kim, and C. Seong Hwang, "Effect of forming gas annealing on the ferroelectric properties of Hf0.5Zr0.5O2 thin films with and without Pt electrodes," Appl. Phys. Lett., vol. 102, no. 11, p. 112914, 2013. J. Muller, et al, "Ferroelectricity in yttrium-doped hafnium oxide," J. Appl. Phys., vol. 110, no. 11, p. 114113, 2011. J. Muller, et al, "Ferroelectric Zr0.5Hf0.5O2 thin films for nonvolatile memory applications," Appl. Phys. Lett., vol. 99, no. 11, p. 112901, 2011. S. Mueller, J. Mueller, A. Singh, S. Riedel, J. Sundqvist, U. Schroeder, and T. Mikolajick, "Incipient Ferroelectricity in Al-Doped HfO2 Thin Films," Adv. Funct. Mater., vol. 22, no. 11, pp. 2412–2417, Jun. 2012. For all of you working on emerging memory technologies such as ReRAM, FeRAM, PCM, MRAM etc. this classification scheme in the latest ITRS roadmap should be very useful. Please check out the ERD - Emerging Research Devices Chapter. 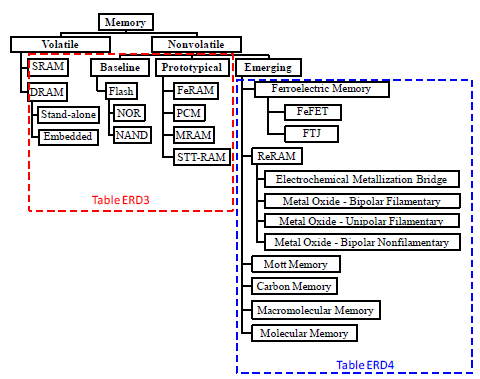 "Figure ERD3 [inserted below] provides a simple visual method of categorizing memory technologies. At the highest level, memory technologies are separated by the ability to retain data without power. Nonvolatile memory offers essential use advantages, and the degree to which non-volatility exists is measured in terms of the length of time that data can be expected to be retained. Volatile memories also have a characteristic retention time that can vary from milliseconds to (for practical purposes) the length of time that power remains on. Nonvolatile memory technologies are further categorized by their maturity. Flash memory is considered the baseline nonvolatile memory because it is highly mature, well optimized, and has a significant commercial presence. Flash memory is the benchmark against which prototypical and emerging nonvolatile memory technologies are measured. Prototypical memory technologies are at a point of maturity where they are commercially available (generally for niche applications), and have a large scientific, technological, and systematic knowledge base available in the literature. These prototypical technologies are covered in Table ERD2 and in the PIDS Chapter. The focus of this section is Emerging Memory Technologies. These are the least mature memory technologies in Fig. ERD4, but have been shown to offer significant potential benefits if various scientific and technological hurdles can be overcome. This section provides an overview of these emerging technologies, their potential benefits, and the key research challenges that will allow them to become viable commercial technologies." Updated FEP Roadmap tables are: High Performance Devices, Low Standby Power Devices, FeRAM, Thermal, Thin Film, Doping Process Technology, Starting Materials, and Surface Preparation. "Likely to be updated" in 2014: Updates to DRAM, Floating Gate Flash Non-Volatile memory (NVM), Charge Trap Flash NVM, Phase Change Memory, Etch and CMP. 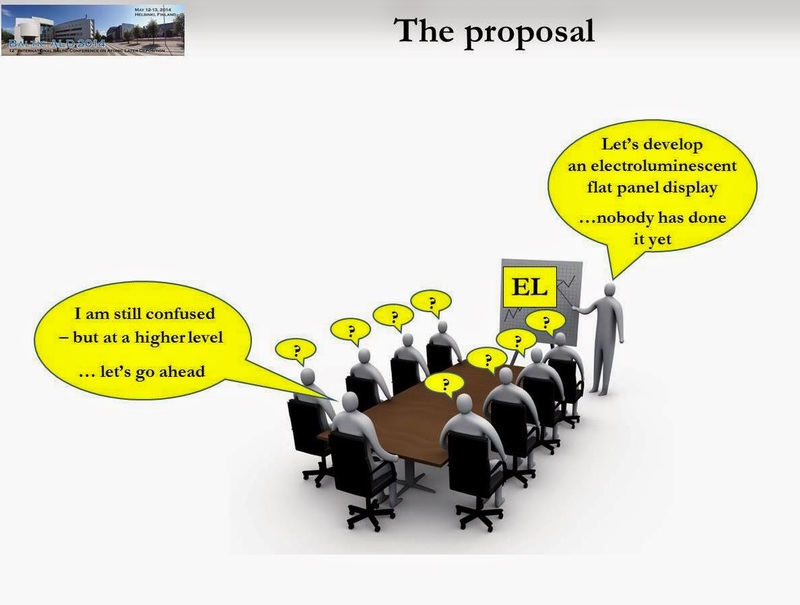 What is The International Technology Roadmap for Semiconductors - ITRS? "The International Technology Roadmap for Semiconductors is sponsored by the five leading chip manufacturing regions in the world: Europe, Japan, Korea, Taiwan, and the United States. The sponsoring organizations are the European Semiconductor Industry Association (ESIA), the Japan Electronics and Information Technology Industries Association (JEITA), the Korean Semiconductor Industry Association (KSIA), the Taiwan Semiconductor Industry Association (TSIA), and the United States Semiconductor Industry Association (SIA)." "The objective of the ITRS is to ensure cost-effective advancements in the performance of the integrated circuit and the advanced products and applications that employ such devices, thereby continuing the health and success of this industry." 2013 ITRS executive summary, in the autumn of Moore's Law. Abstract: Atomic layer deposition (ALD) is a vapor phase technique capable of producing thin films of a variety of materials. Base on sequential, self-limiting reactions, ALD offers exceptional conformality on high-aspect ratio structures, thickness control at the Angstrom level, and tunable film composition. With these advantages, ALD has emerged as a powerful tool for many industrial and research applications. In this review, we provide a brief introduction to ALD and highlight select applications, including Cu(In,Ga)Se2 solar cell devices, high-k transistors, and solid oxide fuel cells. These examples are chosen to illustrate the variety of technologies that are impacted by ALD, the range of materials that ALD can deposit – from metal oxides such as Zn1−xSnxOy, ZrO2, Y2O3, to noble metals such as Pt – and the way in which the unique features of ALD can enable new levels of performance and deeper fundamental understanding to be achieved. An excellent overview on all solid-state 3D thin-film batteries where Philippe Vereecken principal scientist at imec, and associate professor at KU Leuven explains "One way to make Li-ion batteries more durable, safer, smaller and in particularly faster, is a transition towards all solid-state 3D thin-film Li-ion batteries." The article can be find on page 30 in the May 2014 issue of Solid State Technology. UPDATE: this paper is also available here as html Solid State Technology. ALD processes for solid state lithium batteries has been and is an active field of research at Oslo and Helsinki University. Below is a recent review from Ola Nilsen et al giving a great overview on the ALD precursor and processes that have been investigated so far. The lithium ion battery concept is a promising energy storage system, both for larger automotive systems and smaller mobile devices. The smallest of these, the microbatteries, are commonly based on the all-solid state concept consisting of thin layers of electroactive materials separated by a solid state electrolyte. The fact that solid state electrolytes are required puts rather severe constraints on the materials in terms of electronic and ionic conductivity, as well as lack of pinholes otherwise leading to self-discharge. The atomic layer deposition (ALD) technology is especially suitable for realization of such microbatteries for the Li-ion technology. 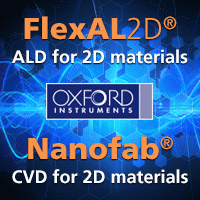 ALD has an inherent nature to deposit conformal and pinhole free layers on complex geometrical shapes, an architecture most commonly adopted for microbattery designs. The current paper gives an overview of ALD-type deposition processes of functional battery materials, including cathodes, electrolytes, and anodes with the aim of developing all-solid-state batteries. Deposition of Li-containing materials by the ALD technique appears challenging and the status of current efforts is discussed. Atomic Layer Etch Finally Emerges - is a interesting blog post by Mark LaPedus (Executive Editor for manufacturing at Semiconductor Engineering) that you should really read if you want some insight into why we need ALE and why it has been difficult to develope this etch technique. After nearly two decades of being confined to R&D labs, equipment makers are placing big bets on this next-gen plasma etch technology. According to a press release : PV equipment suppliers, RENA and SoLayTec said they had shipped their 10th ‘InPassion’ system to a tier-1 fully integrated PV manufacturer based in China for monocrystalline solar cells. The InPERC turnkey package consists of a complete rear-side smoothing, passivation, capping SiNx and laser ablation solution, which is capable of increasing average conversion efficiencies by more than 0.8%. The technology partners have demonstrated PERC solar cell efficiencies of over 20% with record efficiencies achieved at research centre, ISFH. The partners said that they would be presenting the results of their InPERC technology for multicrystalline solar cells with efficiencies above 18% at SNEC 2014. 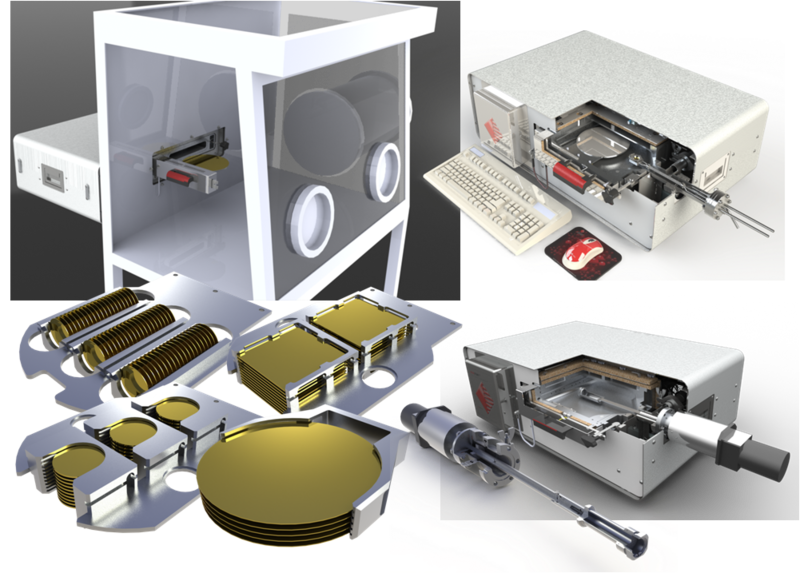 As ALD Pulse reports : Arradiance® Introduces Their GEMstar XT-P™, the First Benchtop Thermal and Plasma-Enhanced Atomic Layer Deposition System for Research . The next generation GEMStar XT-P™ provides enhanced thermal and plasma ALD capabilities for cutting-edge nanoscale materials deposition. Omid Zandi and co-workers at the Materials for Energy Conversion Group, Michigan State University are using ALD for the deposition of metal oxide semiconductors, doping and coatings, for solar fuel production purposes. Recent published work in Journal of Physical Letters about solar water oxidation with hematite deposited and modified via ALD allowed them to study and overcome the limitations of this system which led to the record performance reported for hematite based photoanodes recently (J. Phys. Chem. Lett., 2014, 5 (9), pp 1522–1526 below). Hematite (α-Fe2O3) thin film electrodes prepared by atomic layer deposition (ALD) were employed to photocatalytically oxidize water under 1 sun illumination. It was shown that annealing at 800 °C substantially improves the water oxidation efficiency of the ultrathin film hematite electrodes. The effect of high temperature treatment is shown to remove one of two surface states identified, which reduces recombination and Fermi level pinning. Further modification with Co–Pi water oxidation catalyst resulted in unprecedented photocurrent onset potential of 0.6 V versus reversible hydrogen electrode (RHE; slightly positive of the flat band potential). (Picture from graphical abstract). Growth mechanism and the effect of doping hematite with Ti can be found in this publication: Highly photoactive Ti-doped α-Fe2O3 thin film electrodes: resurrection of the dead layer. According to press release : VTT Technical Research Centre of Finland has developed smart optical measuring devices with companies for uses that include optimisation of vehicle engines, reduction and monitoring of environmental emissions, and quality control of pharmaceuticals. The FABRY research project aimed at utilisation of VTT-developed technologies to enable commercialisation of new products on global markets. So far, two of the companies involved – Rikola Ltd from Finland and InnoPharma Labs from Ireland – have launched products of their own. VTT’s technology makes it possible to miniaturise an entire measuring laboratory to the size of a small sensor. 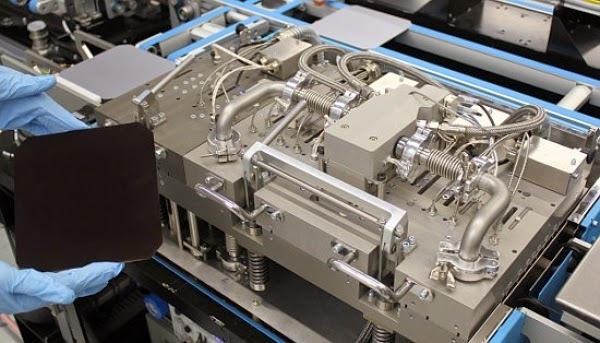 Originally, VTT developed these optical measurement technologies and the associated micromechanical Fabry-Perot interferometer components for the purpose of carbon dioxide measurements. The technology has many other applications, however. VTT joined together with eight companies in the Tekes-financed FABRY project in order to create business from the technology in the form of new products. In the course of the project, five of the companies started a product development project of their own based on the project results. So far, two of the companies have launched a new product on the market. Rikola Ltd manufactures and sells the world’s smallest hyperspectral camera, which can be used, for example, for surveying fertilisation and irrigation needs in agricultural areas from UAVs. The Irish InnoPharma Labs manufactures Eyemap cameras for the pharmaceutical industry, facilitating rapid verification of the drug ingredients and their distribution in a tablet. VTT is also in the process of establishing a spin-off company based on this technology, with expected launch in May 2014. “Apart from new business operations, optical measurement technology also has an impact on employment. In the long run, this could create dozens, or maybe even hundreds of new jobs in Finland,” says Jarkko Antila, Senior Scientist at VTT, who has been coordinating the project. 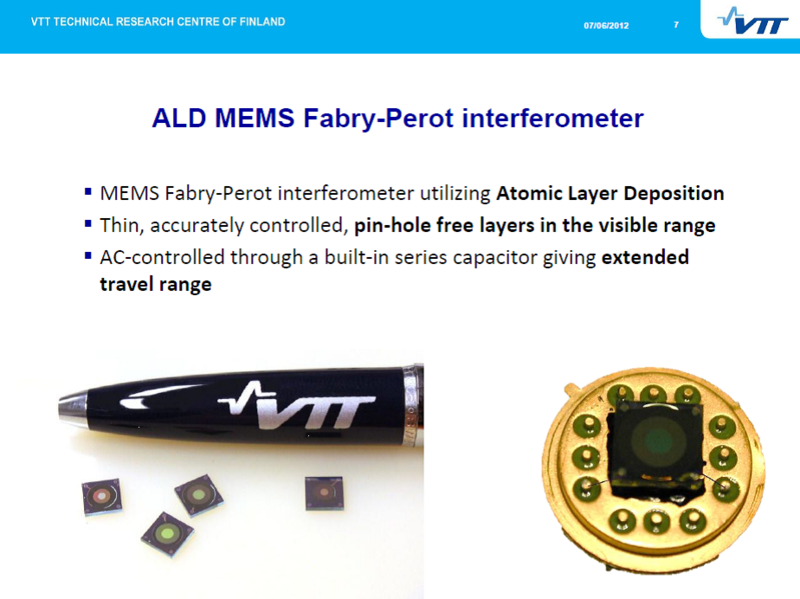 Participants in the 2011–2014 FABRY project (Spectroscopic sensor devices based on novel FABRY-Perot interferometers) coordinated by VTT were Continental Automotive SAS from France (fuel measurements for the automotive industry, onboard sensor); SICK AG from Germany (demanding industrial gas measurements); InnoPharma Labs from Ireland (automatic quality management and control for drug manufacturing in the pharmaceutical industry); Ocean Optics from the United States (optical spectroscopy and Raman spectroscopy); Murata Electronics from Finland (sensor manufacturing for the automotive industry); Rikola Ltd Oy from Finland (cameras for hyperspectral imaging ; manufacturing of spectrometer modules); Okmetic Oyj from Finland (development and manufacturing of high-quality silicon wafer for optical sensor applications) and VTT Memsfab Ltd (manufacturing of MEMS components). The principle of optical measurement, developed at the end of the 19th century, is a widely used technique, for example in astronomy. Expensive scientific instruments are used to identify and measure different materials based on their characteristic spectral lines, thus obtaining information about the composition of the target. VTT has combined this technology with microelectromechanical systems (MEMS), creating an affordable, very small and adjustable spectral filter. This makes it possible to miniaturise an entire measuring laboratory to the size of a small sensor. http://www.vtt.fi/files/newsletter/os/022012/spectral_imaging_device.pdf. It is unclear if this ALD technology is used in the commercial product.